Don’t lose sleepover your next outdoor adventure. Designed for the camping and outdoor enthusiast. Specifically designed for the outdoor enthusiast in mind - where space is minimal and your aim is to sleep maximum campers per tent. The Cam-O-Bunk (Large) comes with all the exciting features outlined by the Cam-O-Bunk (XLarge), the only difference being that the width of the sleeping deck is slightly narrower. 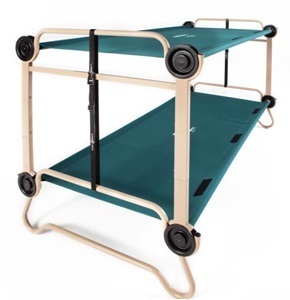 XL vs L You can bunk it, bench it or turn it into two single cots – whatever your preference or requirement, the Cam-O-Bunk (Large) offers you one extreme cot system with many simple solutions. Post by Tipi Adventures Ireland.